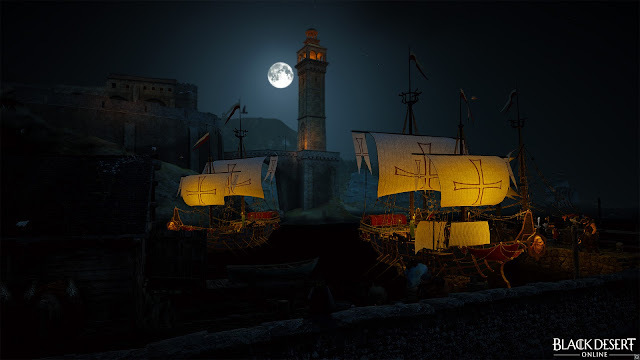 I recently took a break from the general grinding, leveling, and money-making in Black Desert Online (Steam) to complete the ocean questline, "The Uncharted Sea, History of Margoria." This series of about 20 quests took me from Port Epheria to a number of small islands, then across the sea on a 45-minute ferry trip to Port Ratt. The quests mostly required sailing, fishing, diving, and underwater exploration. I started, regrettably, with nothing but the simplest raft. From looking ahead at the quests I knew I would receive a fishing boat down the road, so I decided to struggle through on my raft until then. I set my destination, turned on the autopath, and minimized Black Desert for a bit. This strategy worked well enough to get me through the first few quests and on to Lema Island, where I both received a fishing boat and caught the long ferry to Port Ratt. It is possible to make the journey on your own, but probably not a great idea in a tiny fishing boat. Visiting Port Ratt was worth the trip. The charming little port, with its unique architecture and style, and a distinct lack of other players, was an appreciated respite from the normal bustling towns. Port Ratt has few NPCs and only a handful of quests, but they were just enough for me. Although I enjoyed traveling around Port Ratt on my new fishing boat, discovering new islands, I would not say that the quests were particularly fun. 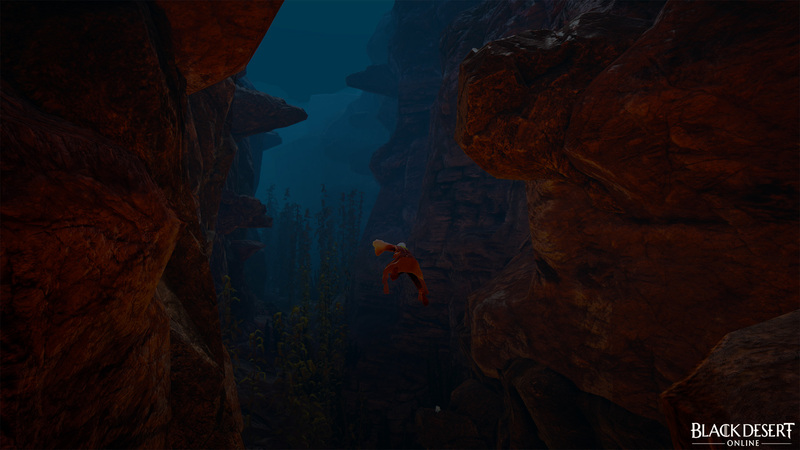 The quests themselves were not the problem, but many of them required a lot of swimming, especially underwater, and frankly, the swimming in Black Desert Online is bad. The swimming controls are unresponsive, the movement is incredibly slow, collision issues are everywhere, and the underwater camera doesn't always work correctly. There is no danger; running out of breath simply forces you to the surface, unless you get stuck on something and have to watch the struggling animation repeat over and over again. Worse, many of the underwater objectives are barely reachable with a full breath meter, a full stamina bar, breathing crystals in armor, a breathing potion, and high movement speed. At one point I resorted to logging out and logging back in to restore my breath underwater as I couldn't see any other way to reach the objective in time. Of course, the cash shop does offer two swimming costumes. The "Splat Fisher Clothes" increase swimming speed and reduce endurance consumption in the water for only 2200 pearls (about $22). A shark-themed "Diving Suit," also 2200 pearls, offers the same, but with additional breathing time too. These are of course not strictly required but their purchase certainly seems encouraged. Despite the swimming frustration, though, I did have a good time. For a few hours, I was able to mostly ignore combat. I could take my time fishing, gathering new items, and sailing the seas. Along the way, there were some nice rewards, like the fishing boat and a (cosmetic) diving mask. The finale, a dive into sunken, ancient ruins, had some valuable treasure. I may not ever return to Port Ratt, but I am glad that I visited it once. If I do, I will probably build a better boat first, like the Epheria Sailboat. But that is another story. 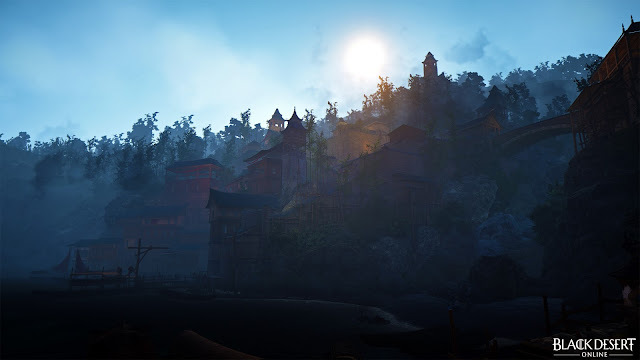 For more on my travels in Black Desert Online, continue below to see my exploration of the desert or return to the beginning to see how I started out.